Overplay is closing its services down very soon. So it is best for users to find another DNS service provider. Click here to have a look at the top DNS service providers in the market right now. Overplay Smart DNS boasts of being “Your passport to the World’s entertainment fast lane”, due to the super fast speed of streaming that it provides. Using your Internet connection, you can connect all the devices of your preference and enjoy great benefits related to watching channels and shows that would not be available for watching otherwise. This means that if you have a Netflix account, then you can unlock Netflix from ANY country including the US version which has the most amount of title by far. The Overplay SmartDNS unblocks Netflix in your browser AND in your Netflix app! I have personally tested this as recently as July 2016 and I use it every day. Instead of settling for the geographical restrictions in your country, you can go ahead with choosing a Smart DNS service like Overplay and forget all about feeling frustrated over a specific prohibition from relishing blocked content. This has intrigued us enough, so as to cover the review and conclude as to whether or not the whole fuss is justified. Stick with us, in order to find out more about this company and the product we focus on! VPN is what adds to the overall online protection of yours while surfing the web. However, at times the whole process of encryption causes significant lowering of the speed and consequently leads to the deterioration of user experience. This is what has emerged the need for something really fast and efficient. Smart DNS servers are able to fill that gap and cover the need for something both speedy and reliable, even though they do not add any protection layer to the Internet connection. Having that in mind, let’s have a look at the special features of Overplay Smart DNS! Smart DNS is an innovative service that resembles the use of a VPN account, but without the speed loss of the VPN. Indeed, Overplay offers the opportunity for users to browse instantly and unblock channels and sites that were not accessible. If your device runs on iOS, there is the Smart DNS App available for you to download and facilitate the process even more. You bypass the restrictions applied to countries and you get to enjoy services like Netflix or Hulu in a jiffy. Although the VPN is much better in terms of security, Overplay does a stellar work in terms of speed and effectiveness. No logs are kept and this is something definitely worthy of attention. Setup is easy and simple, providing the opportunity to start reaping the benefits of your subscription without any delay whatsoever. As we have stated above, Smart DNS is quite different than the VPN service. Nevertheless, Overplay is able to offer both of these services. In the case of VPN, Smart DNS is included within the package and the monthly fee goes up to $9.95. 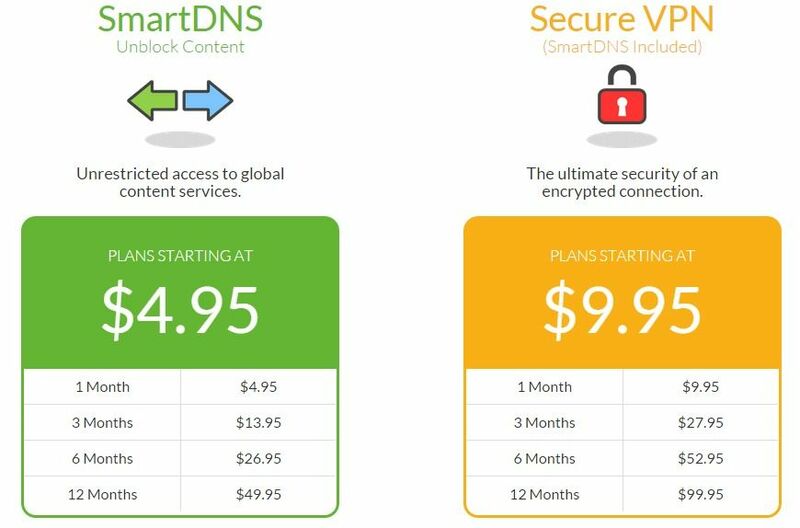 If you are simply interested in Smart DNS, the monthly price is $4.95, while there are discounts for longer contracts. In specific, $13.95 is the cost for three months, $26.95 for six months and $49.95 for a whole year. There is a two-day risk-free trial, which could be a bit longer. In fact, unless you are planning to test your Smart DNS to the maximum within these two days, you might not get the chance to form solid conclusions of your own. Other than that, there is no mentioning of money refund guarantee. On the bright side, there is ample flexibility when it comes to payment methods accepted. Credit cards and PayPal can do the trick for you, though the latter is not available in recurring accounts. We move forward with our review and this is one of the best aspects of this service. Indeed, Overplay offers a wide range of frequently asked questions and a rich knowledge base on the official website of the company. What is more, there is the live chat provided for direct feedback on your queries. In addition, you can benefit from a blog that includes valuable pieces of information. If all these methods fail, you can always submit a ticket with your question and have an answer as soon as possible. Overall, Overplay Smart DNS comes with an impressive support and help department. Another great aspect of Overplay Smart DNS is that of its compatibility. In fact, Overplay runs on any device and OS you may wish to use. Whether you are using Windows or Mac, Linux or Android and iOS, DD-WRT or Tomato routers, you can count on Overplay for getting instant results and profiting from the descriptive setup guides. Especially for iOS devices, you can download the respective app from Apple Store and make your life even simpler. You can even use the Overplay SmartDNS on your Smart TV, X-box, PlayStation or Kodi! Now that we have completed our review of Overplay Smart DNS, we have to admit that this is a reliable alternative to VPN for people who enjoy unblocking sites internationally. In the field of entertainment, there are many channels that you can unblock with the use of Smart DNS. This service is quite affordable and particularly if you commit for longer time periods. What has let us down a bit is the two-day free trial, which we think should be longer. The payment methods are really helpful, offering the chance to customers towards finding the method that best suits them. Setup is simple (although novices might disagree) and there is unique compatibility you can benefit from. With impressive support and help, Overplay Smart DNS is certainly a service that has got to offer a lot to Internet users who value speed and unblocking abilities for channels and sites of all sorts globally! Overplay Smart DNS offers an alternative to VPN, in order to unblock GEO-IP restrictions and enjoy channels of all sorts (like Netflix and Hulu to name a couple) worldwide. It is quite affordable and provides exquisite speed, the software is easy to use and the options are awesome. On the other hand, there is no encryption included and thus does not offer any security layering, but that is the same with all SmartSNS's. The most outstanding point about Overplay SmartDNS is that it works 100% to Unblock US Netflix in the browser AND in the Netflix app! Hardly any other provider can offer this as Netflix blocked them. No Chat option on the website I’ve paid for Netflix US and Overplay VPN now nothing is working whom do I ask for help. I need my money back. I am loosing my Netflix subscription. Who is going to pay for that? Message to them: Provide me a refund and I’ll switch to another VPN provider.